As well as on-page content updates, blogging, link-building and content marketing, technical SEO is a big part of search marketing. The aim of technical SEO is to make sure Google sees your website in the best possible way. Without the correct back-end work, Google could have difficulty crawling your website, could see problems where there are none, or could skip over your website altogether. One way that Google often sees a mis-representation of websites, is through duplicate content. One of the big Google rules is avoid copying text from other websites, and don’t repeat the same text across multiple pages of your own site. Sometimes, however, even if you may not intentionally repeat text across two pages, Google can see that you do. This generally happens when you have a category page, which has options for product re-ordering. For example, your product category is hosted on: www.yoursite.com/products. When a user clicks to order products by alphabetical order, the URL that they see is www.yoursite.com/products?order=alphabetical. For the user, this isn’t a big deal, but Google will see that as two separate pages, with the majority of the text the same, and this is where canonical tags are needed. A canonical tag, which is hidden in your website header, tells Google that these are the same pages. For the above example, the correct way to use the canonical tag is to put link href=”www.yoursite.com/products” into the header of www.yoursite.com/products?order=alphabetical. This tells Google to pass any link juice, or page authority from www.yoursite.com/products?order=alphabetical over to www.yoursite.com/products. Sometimes canonicals can be useful to use on products. 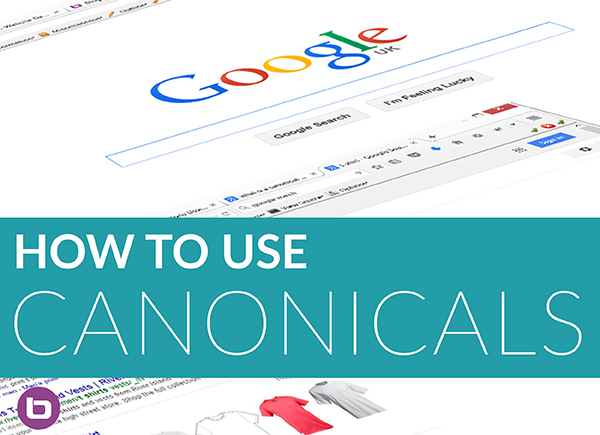 If you have a number of products which have different enough features to justify being on a separate product page, but essentially are the same, canonicals can come into play. For example, if you have V-neck T-shirts in blue, red and green, the product text is likely to be the same, but you may prefer to have separate pages for each colour. It can be tricky writing separate text for a different product if all but the colour is the same as a number of other products on your site, but unfortunately, Google will see these multiple products as being duplicate content, which damages your search ranking. Choose the best-selling of the products, and on the other product pages, add canonical tags pointing to that one. For example, if your red t-shirt is the best selling t-shirt, use canonicals on the green and blue ones, directing Google to the red one. Include links to the other colours in those product pages. Google will see the best selling product as being the only one to rank in the search results, and therefore, users searching for your t-shirts will only find the red one. By including links to the other colours, you can make sure they stay on your site and find the colour they want. The general rule for using canonicals is to only use them if you need the user to see more than one page, but you need Google to only see one page. If you have any questions about using canonical tags in your SEO strategy, please contact us at info@bwebsites.co.uk.